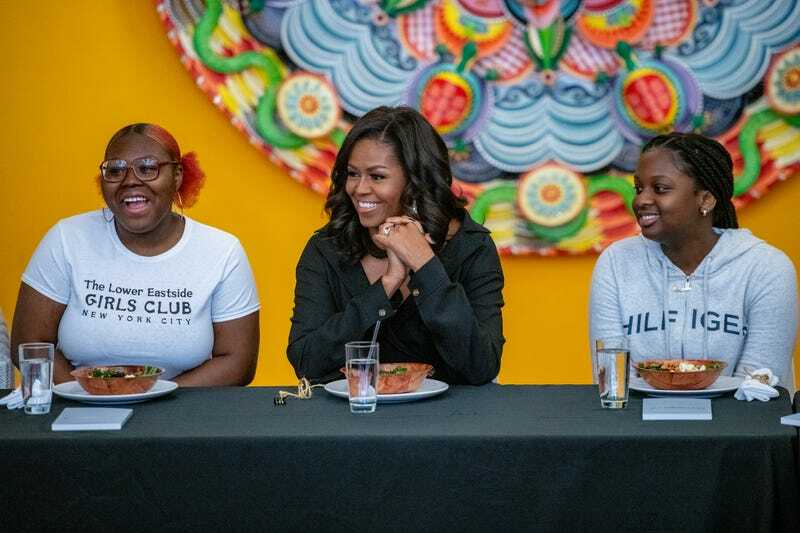 Former first lady Michelle Obama visits The Lower Eastside Girls Club to meet and greet the members and discuss her new book ‘Becoming’ on December 01, 2018 in New York City. Despite consistently saying that she has no interest in running for president, Michelle Obama has once again confirmed that she doesn’t want to be president. But I, like the rest of us, am not trying to hear that. You hear that fans of Michelle Obama for president? She explicitly stated that he doesn’t want to be commander in chief but she laughed after she said it during her visit with Lower Eastside Girls Club in Manhattan where she was asked about whether she’d run for the White House, The New York Post reports. That laugh means that we still have a chance, right? Despite the fact that she’s one of the most beloved first ladies in the history of first ladies, and that former President Obama would be back in office and Vice President Oprah Winfrey (who would surely be her running mate) would hold taco Tuesdays in the White House and maybe we’d all get healthcare Oprah style (You get Medicare, and you get Medicare!) Michelle Obama is not running. The Post notes that Michelle Obama reiterated that she doesn’t want to be president in her bestselling memoir Becoming, although she’s beloved by Democrats, and could beat President Trump easily. Hillary Clinton also said she won’t run for President again before she recently said she might, so there’s always hope. Obama cited several reasons during her appearance but added that she really wants to give her daughters a break from the constant media pressures of being back in the White House, that she’d surely win should she run for office in say, 2020. On Sunday, Michelle Obama announced that she will cancel two stops on her book tour to attend the funeral of former President George H.W. Bush. No word on if she’s reconsidered running for president.